Note: The term “deaf” is defined as partially or completely lacking the sense of hearing, therefore it includes those considered “hard of hearing”, as well. Hopefully, you have noticed in this series, “So You Want to Adopt a Deaf Child?”–6 posts thus far–the topics covered and information shared are somewhat different from other information found in other places. We try to address topics that are rarely even thought about, prior to adopting a deaf child, but will greatly impact a family if they do adopt a deaf child. We believe it is the right of the deaf child to have adoptive parents who are highly skilled and prepared specifically for their vast needs, prior to bringing them home. We believe the information these blog posts are covering will help equip them to do that, IF they decide to proceed with the adoption of a deaf child. In the year 2014, we live in a world of much misinformation–false and/or inaccurate information sharing. Sometimes it is because only some of the information is readily shared or easily discovered. Often times, the media shares information that will only cause the greatest emotional response, with hopes that will guarantee them more faithful followers in the future. Sometimes, it is just easier not to share all the information upfront because it is too overwhelming. Let’s just face it, sometimes, we are easily satisfied with what we are told, initially, because we like it and are not willing to do the necessary work to do an exhaustive information search on our own. I could site many examples of this, but the one that is nearest to me, at the moment, is the one that I will share in this blog post. If I randomly interviewed people on Any Street, USA and asked the question…”Does the Cochlear Implant make someone who is deaf, hearing?”, for those who have heard about the Cochlear Implant (CI) before, I have no doubt an overwhelming majority of people would respond, “Yes, of course, it does!”. While their response is “partially true”–the Cochlear Implant (CI) does provide the recipient with the sensation of sound, albeit much different from the sound our natural hearing provides–there is much more information the parents desiring to adopt a deaf child must know. This will not be a simple or easy journey, gaining full knowledge surrounding the CI, but I believe it is a vital one and one every deaf child is worthy of. Many adoptive parents, adoption agency personnel, and incountry orphan care workers ASSUME the CI will “fix” deafness. That simply…is not true. It will require much time in research and prayer, on your part, parents, to uncover all the necessary information to make a wise decision concerning the CI. Not doing so, I believe, is a disservice to not only the deaf child, but also to yourself and the rest of your family. Cochlear Implant Simulation: Click the above picture to hear what “sound” sounds like through a Cochlear Implant. For the “adopted” deaf/HOH child, whose brain has been deeply traumatized and whose emotional and social development is grossly immature, the functioning outcomes of the CI have never been researched. The functioning outcomes of the CI are the measurable benefits the CI provides the recipient in communication access –listening and speaking skills. The ultimate test of these skills are when the recipient communicates with those in the natural hearing world and not just among their immediate family members who become accustomed to understanding their speech no matter the clarity. The published outcomes of the CI on the deaf child are based almost solely on those who are born into loving families, with healthy developing brains and with the greatest of external professional resources for skill training, not on the “adopted” older deaf/HOH child’s brain. 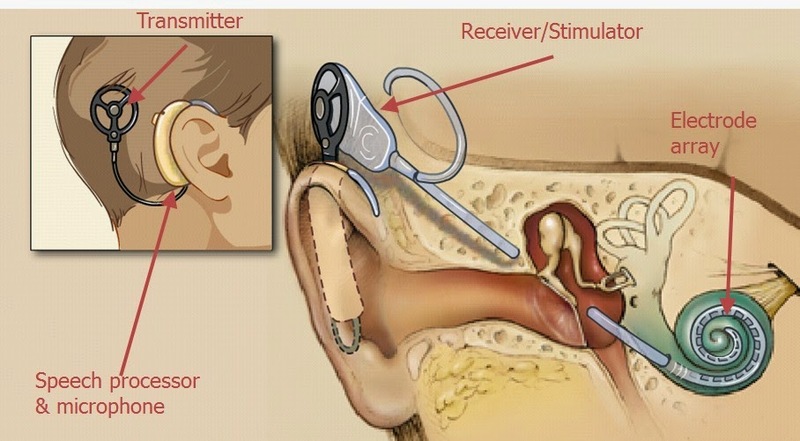 What is the Cochlear Implant? “A cochlear implant is a small, complex electronic device that can help to provide a sense of sound to someone who is profoundly deaf or severely hard-of-hearing HOH. The implant consists of an external portion that sits behind the ear and a second portion that is surgically placed under the skin (see the above picture).” (www.nidcd.nih.gov) There is also an internal probe that reaches down into the Cochlea (inner ear), where sound is transported to the brain for comprehension. The CI destroys all residual hearing the recipient might have. Of course, there are always risks involved with a surgery of this magnitude, so research those here. Who is a candidate for the CI surgery? Check the Laurent Clerc website for basic information on the criteria for CI candidacy. Chances are you have seen the emotional videos on FB and/or TV showing the first time a young child has “heard” his/her mother’s voice. They do pull at your heart strings, but these videos can be misleading as you must remember this child is not suddenly hearing AND understanding their mother’s voice, as you and I might first be tempted to believe, they are simply hearing “sound” for the first time, provided by the CI. As you heard in the simulation video above. Many years of intensive speech and hearing training and thousands of hours of therapies will be required to enable this young pre-lingual (knowing no spoken language prior to implantation) deaf child the optimum use of the CI, whatever that might be for each specific child, as it is different for each individual recipient. Do you ever wonder, as I do, why it is we rarely see follow-up videos and reports on the outcomes/successes of these children as they grow into adulthood? One would think they would be the best advertisement for those doing the CI surgery and those manufacturing the CI. I believe it is partially because ultimately the outcomes of the CI vary so greatly from one recipient to another and so many children implanted do not grow up to be as “hearing” as we are initially led to believe. While the CI is considered “successful” as it does provide “sound” for the recipient there is so much more involved than just “hearing” that sound. The brain must be trained to translate that sound into comprehendable meanings that then translate into language and speech and most-desirable clear communication with another hearing person. Sometimes the comprehension of speech being heard via the CI surpasses the recipients ability to then vocalize the correct sound(s) and speak clearly. The ability you and I have to speak clearly is directly related to what we hear and how well our brain can translate what we hear, therefore what a CI recipient “hears” will directly determine how well they speak. Just to give you an idea of how hard it is to master spoken language, unnaturally, click on the video above. Rachel Kolb from the TEDxStanford website is profoundly deaf, but had 20 years of speech therapies and very supportive parents from birth. She was a student at Stanford and a Rhodes Scholar when she gave this speech in 2013. While she speaks clearly, to some degree, she prefers to communicate through sign language, as she says it is a much more natural communication for her. Her talk is given in spoken English, but she is also fluent in American Sign Language. Rachel is bi-lingual (English and ASL) and bi-cultural (hearing and Deaf Culture). Experiment: Try NOT looking at Rachel while she is speaking and see how well you can understand her. Rachel is studying abroad this fall at Oxford, majoring in English and writing. An ASL (American Sign Language) interpreter will accompany her. It is vitally important to understand the backgrounds of CI recipients to further understand the unique challenges they will face in interpreting the sound generated by a CI accurately and then utilizing that interpretation for communication and functioning in the “hearing” world. Generally, there are three different categories or groups of CI recipients. 1) Post-Lingual (after spoken language develops) CI Recipient – typically the age represented by this group would be a hearing child or adult that is already speaking, age 36 months and older, but lost their hearing suddenly due to an injury, illness or as a result of prolonged use of certain drugs prescribed for an illness. This category represents a very small group of deaf/HOH children, as the above situations are rare. If the recipient of a CI was hearing and speaking (post-lingual) prior to implantation, the brain’s ability to match the new sounds it is hearing with the original sounds it knew, will be much more natural and, therefore, somewhat easier. The sounds will not “sound” the same, of course, as you heard when you listened to the CI simulation above, but the brain’s ability to connect the new sound with meaning will be greater than for those who did not hear and speak naturally before implantation. Putting on the CI is not the same as putting on a pair of glasses to perfectly correct your vision. It will take much time to re-train the brain to learn what each new sound represents. I have heard of some newly implanted recipients, in this post-lingual category, going throughout their homes flushing the toilet, turning various appliances on and off, and practicing bodily functions to be able to determine which new sound specifically represents the old natural sound. The same is true for speech following a CI surgery. A recipient’s own voice, now heard through the CI, will sound different than before, as will all other voices. The brain can adapt well, however, if it was already programmed to hear AND comprehend speech, naturally, before the CI surgery. For the vast majority of CI recipients who were hearing and speaking prior to implantation, the outcomes for a fully functioning life in the hearing world are much higher than for those who have never heard and spoken before. For the young deaf/HOH child, 6 – 36 months of age, with a neurologically-healthy functioning brain, the CI can possibly become the hearing replacement or sound producer for acquiring language, more so than for those older who have surpassed this critical sound and language acquisition phase of life, up to 36 months. That is not to say all children implanted prior to 36 months of age will become fully functioning and communicate with ease in the hearing world, as research does NOT support those outcomes. There are innumerable variables involved with each unique deaf/HOH child and the many external resources (therapies and trainings to help the recipient produce listening and speaking skills) which will be needed for obtaining the maximum benefit. It is important to understand that the way a hearing child naturally learns a language is by first hearing sounds and mimicking them repeatedly, practicing until it comes out correctly-spoken. The developmental process of spoken language really begins in utero for the unborn child and continues for at least the next 36 months. For the older deaf/HOH children, implanted at age 3 (36 months) and older, outcomes granted by the CI vary significantly. Those deaf children who have not been exposed to spoken language because of their deafness, prior to 36 months, will struggle to master spoken language and good listening skills. Spoken language takes longer to develop, even naturally, than visual language; hence the reason so many hearing parents now teach their hearing babies sign language, so they can begin communicating their wants and needs as early as 8 months of age. Note: The research outcomes for the above categories are not based on the “adopted” deaf/HOH child, but are based almost solely on the deaf/HOH child born into loving hearing families. In addition, the required professional support services all CI recipients must receive for producing the best outcomes (listening and speaking skills) are local and readily available to these children and they and their families are fully utilizing them. When researching the CI prior to adopting the deaf child, three equally important things to remember for the deaf child you desire to adopt are shared below. These three factors MUST be foremost in your mind as you sift through the research for the CI. 1) Language Acquisition – Rarely are the brains of the adopted deaf child in the prime age of language learning from 6 months to just under 36 months (3 years) when they are adopted. In fact, most are over 3 or 4 yrs of age and some are as old as 10.Yes, some deaf/HOH children are available for adoption, with no exposure to language at all even at the age of 10. Keep in mind, the time span between 6 months and 36 months is the “full developmental process” for language learning. There is nothing magical about simply being under 36 months when the deaf child receives the CI. The vast majority of adopted deaf children are beyond the “optimal time”, according to their brains, to “master” language. This does not mean they cannot learn language, but it does mean the process will be laborious and take many years of training. 2) Neurologically Unhealthy Brain – All adopted deaf children will have experienced trauma. The same is true for all adopted children, but remember the deaf child will also have additional trauma because of the lack of language and little to no communication for bonding with peers and/or caregivers. In fact, deaf children tend to be targeted by their hearing peers and their hearing caregivers for additional bullying and abuse…physical and sexual. Which means, even if you do find a deaf child under the age of 3 to adopt, the trauma they have experienced will greatly impact their brain’s ability to not only bond with you and others, but also acquire language, immediately, as it will not be a neurologically-healthy functioning brain. Not only will this neurologically unhealthy brain delay the ability of the deaf child to learn and master language, it will also mean the many years needed to develop spoken & understood language (communication) via the CI, will also delay the bonding between the child and their hearing, speaking family members. Signed language can bridge those two gaps much more quickly. Clear communication is vital to building trust and felt-safety for the adopted child and without that the deaf child’s traumatized brain will not be begin to heal and become healthy. 3) No matter what country the adopted deaf child comes from, the medical records will be sorely lacking in their diagnostic evaluations, especially concerning the child’s deafness. The extent of deafness of an adopted child can rarely be fully known until they are evaluated comprehensively here in the states. Hearing screening and testing is rare in other countries, especially of institutionalized children. Deafness is not visible and it can be easily overlooked, especially in the child under the age of 3 or 4. Older non-verbal children MIGHT be suspected of hearing loss, but rarely then are they even tested. Some children labeled “non-verbal” could also have hearing loss. I know many stories of families adopting a child and following their first physical here in the states their deafness is discovered. No one knew! I also know of several stories of families specifically adopting a deaf child and when they arrive home they find out their child’s deafness was a severe case of ear-wax buildup. You see many pictures of children wearing hearing aides and maybe even CI’s, in other countries, not until they are evaluated, here, do you know if any of them actually benefit the child…or even work for that matter. Do not trust what is in any “waiting child’s medical file” as being 100% accurate or complete. After hearing so many stories of inaccuracies–misinformation–relating to the medical files of adopted children you simply cannot trust what is listed there or what may not be listed there as factual. Adoption, truly is an act of faith! As we all know visual language–mime, gestures and sign language–is often much more easily understood even by people from different cultures and different spoken languages. The use of sign language and gestures with the deaf child will greatly increase their understanding and will begin to strengthen their bond with their family members, in a much more timely manner than the long-awaited outcomes of the CI. In addition, the increased visual communication opens their brains to a much bigger world, creating a more healthy environment in which to grow their brains whose development has been stunted by trauma. Using visual language to communicate with the adopted deaf child will also begin the process of bonding and connecting, much more quickly. Much the same as the reasons for teaching hearing babies to sign before they can speak. Test: The video above has no spoken language. Not one word. See how much of it you can understand, visually. What Is the Best & Quickest Way to Learn ASL? Parents MUST be fully informed of ALL the requirements and challenges surrounding the implantation of the CI for their deaf/HOH adopted child, from pre-surgery and for the rest of their lives. I understand my child will hear sounds, but will he/she be able to understand what is heard clear enough so they can begin speaking clear enough to function “normally” in a hearing world? If so, how long with this process take? Will my child need additional support(s), in addition to the CI, to reach their highest possible functioning level within the hearing world? If so, what are they? What is the average number of years it takes for an older deaf/HOH child (over the age of 3), following implantation to begin to speak in full sentences accurately and being fully understood by others and with an age-appropriate level of comprehension? How long will the CI last? Will it need to be replaced? Will my insurance cover the CI surgery AND all the needed therapies and trainings that are required for optimum listening & speaking development? Could the fact my adopted deaf/HOH child’s brain has been traumatized by neglect and institutionalization sabotage the best possible outcomes provided by a CI? Will you allow us to still use sign language with our deaf/HOH child after implantation(some programs will not)? Am I willing and able to commit the time needed to ensure my implanted deaf/HOH adopted child receives every required external resource (listening and speaking skills therapies & trainings), IF they are available in my area, whereby granting them the best environment for developing the highest possible outcomes achievable for them, whatever that is? Last, but certainly not least, is the question of the whole child. How will the CI affect the whole child cognitively, emotionally, physically, and spiritually? The CI requires years of training and therapies for communication (listening and speaking skills) to develop, how will that impact the adopted deaf child’s ability to connect and bond with hearing family members and beyond? How will the CI affect them as they grow into adulthood? I strongly recommend you interview at least 4 adult CI recipients that were implanted after the age of 3 and more specifically those who had no access to language (no hearing aides or speech training) prior to implantation, this will give the best comparison. However, unless they were adopted, with traumatized brain development, the comparison will still not be equal. Always remember the adopted deafchild is unique in their history & trauma, in their personality, in their drive to achieve and/or please, in their ability to stay on task, in their ability to not only endure the countless hours needed for listening and speech trainings and therapies, but also learn from them. Signs for Hope believes it is the right of every deaf child to be given the opportunity to learn sign language as their first mode of communication. Having sign language as a base for communication, not only for bonding between parents and the adopted deaf child, in a timely manner, will also guarantee a continuous mode of communication should the CI not provide the desired and needed fully-functioning access to their “hearing” world years later. If you have additional questions and would like to contact me, Becky Lloyd, please do not hesitate to do so. I may not know the answers to your questions, but we can discover them together. I pray the above information has helped to give a much broader picture of the CI and the “adopted” deaf child. The decision to implant or not to implant is rarely an easy one, as some may mistakenly believe. Instead, it is one that requires much time and patience to gain the full knowledge necessary to make wise decisions for each deaf child.